- That moment when you think you can handle it, so you tip your cup back to take a drink, and it spills all over your face. Yes, I do this often. Mostly while I'm alone... but sometimes around people. - When you are at the gym, trying to work out and there are old men EVERYWHERE. Good for them for being there... but I still feel weird while I'm lifting my 10lb weights over my head. - Trying to catch a football and failing. I love that moment when it hits your finger. And then for the next week your finger is swollen and purple. Oh, and it won't go straight. Yep. - When something gets in your eye, and your contact starts to go crazy. And you are heading to your hair appointment, trying to get it out, but not succeeding. So during your hair appointment your eye is red and puffy, and streaming. I promise I'm not crying because of my hair! Something is in my eye! - The boy at work who walks around with his headphones in, singing along to the music. Dramatically. - Coming home and seeing friends for the first time in three weeks. I love my EFY peeps, but let me tell you, nothing is better than catching up with best friends. - Getting text messages that make you smile. The best is when they are unexpected. Smile smile smile. Happiness. - Convincing your friends that the best way to spend their girls night is by making "friendship t-shirts". Yes, we bought men's v-neck t's from Walmart. And yes we drew on them with Sharpies and made them thuper duper cheesy. It was cute. Embrace it. - Looking forward to family vacations that start TOMORROW!!! The beach is calling my name. Loudly. - The panini maker we recently acquired at my house. I can see myself becoming quickly obsessed with making panini's. Every day. There are so many options of what to do with them!! Any good panini ideas? I'm ready. p.s. i'm quickly becoming a fan of pandora. yes, it took this long. so what? we both did awkward and awesomes. someday i will have more followers than you. muah ha ha ha. Yes! We are soo awesome! Madeline you are just the greatest! 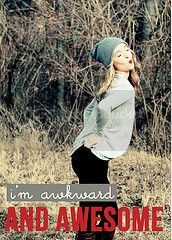 I love being awkward....and sometimes awesome with you. I can't wait to get your letters! I have a feeling they are going to be pretttty good. Hi! I just saw your blog's link on Sydney's A&A page! :) I added myself too, now thát sounds awkward....don't it? Posts like these brings everybody closer to eachother hahaha! ;) Love your blog & following!